Learn Sheffield has produced a guide to support schools to engage with the strategies that have been developed to address the Sheffield Priorities. The content of this development programme is organised under the six themes of the Sheffield Priorities, which form our shared vision for education in our city. Many of the strategies in this document relate to the May 2017 update of the Sheffield Priorities document, which can also be found on this website. www.learnsheffield.co.uk/Strategies/SheffieldPriorities. This document seeks to provide an overview of the various partnerships that are driving educational improvement in Sheffield, whilst also ensuring that all of our education community has access to the opportunities that they can engage with during 2017/18. The content of this programme, and the links to book places on many of these opportunities, can be accessed below. The importance of research as a theme within the Sheffield Priorities was clear from the beginning of the workshops. It would be returned to throughout the development process and the concept of a ‘Research Led Sheffield’ project took shape at an early stage. Learn Sheffield has worked closely with the teaching schools and universities of the city to identify the right partner to work with in scoping this three-year project. Our partner is Huntington Research School, who were one of the first National Research Schools. They are a leading member of the Research Schools Network, which comes from a partnership between the Education Endowment Fund (EEF) and the Institute for Effective Education (IEE). In 2017/18 ‘Research Led Sheffield’ will train a cohort of ‘Research Leads’ and a cohort of ‘Teaching and Learning Leads’. Some of these first cohorts will go on, in years two and three, to become part of a Sheffield based cohort of trainers. Next year, ‘Research Led Sheffield’ will also include a conference, a research newsletter and the development of links to other Sheffield based research, including the work on lesson study. The ambition of ‘Research Led Sheffield’ is that, in three years, the city will have well over a hundred colleagues who are leading on research or leading teaching and learning in Sheffield schools and academies, who have been trained in the use of evidence based practice. If this is accompanied by the growing use of research facilitators by our partnership groups and healthy city network of research projects, then we will start to see the system culture that we require. This conference will be held at the SHU Sheffield Institute of Education (Charles Street Building) on 15 June 2018. Speakers and workshops will be announced in the autumn. The monthly newsletter will contain local and national updates on evidenced based practice. It will be compiled by Huntington Research School. Assessment - to develop practice and resources collaboratively. Moderation - to ensure that high quality judgements are consistent across the city. Data Analysis - to ensure that schools have access to data and are supported with analysis. The 2017-2018 Achievement Strategy contains bespoke activity in each sector, as outlined below. 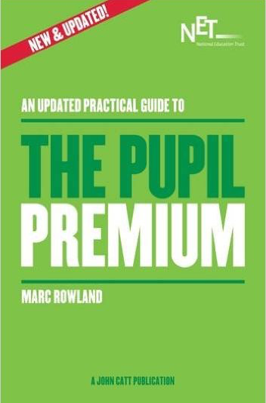 The Pupil Premium Project will be led by Learn Sheffield’s Policy Director, Marc Rowland. Marc has a national reputation for his work on maximising the impact of the Pupil Premium and supporting schools to tackle educational disadvantage. In addition to his work with Learn Sheffield, Marc is currently involved in setting up the Rosendale EEF Research School and working with the Jersey Government on the introduction of a ‘Jersey Pupil Premium’. The project will be an eight-month programme, initially for Sheffield Secondary schools, within the context of a longer term strategy which has already included a conference. It will promote the active ingredients for success in tackling educational disadvantage. This includes a culture of high-expectations and success for all within our schools; rigorous self-evaluation; awareness of challenges facing disadvantaged learners and strategies to overcome them; and a model of self-sustaining improvement. We will be recruiting schools for a primary school project in the summer of 2018. 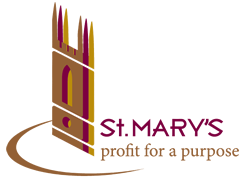 This secondary programme has a minimum of fifteen fully funded places available which are being supported by the Secondary Leaders Partnership from its Learn Sheffield partnership funding. Current-Commissions to download an expression of interest form. Initial Input for school leaders. Supported self-evaluation of participating school strategies for tackling education disadvantage. Individual half day strategy reviews and reports, led by Marc Rowland and Learn Sheffield. Sharing of practice and learning through reports and emerging themes. Individual follow up visits and reports, led by Marc Rowland and supported by Learn Sheffield. End of phase one programme seminar. Gathering to share learning and impact; Published report. Have a strong commitment to affecting change for all disadvantaged learners. 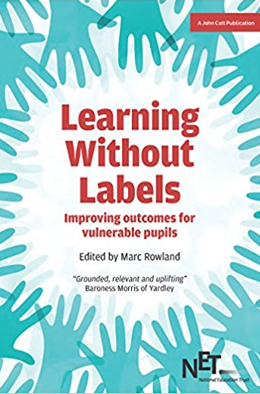 Regard the issue of tackling disadvantage as achievable and a core theme which permeates the work of the school at every level; therefore, the programme needs to sit within a long term strategy and the over-arching improvement plan. Demonstrate the leadership capacity needed to affect change at both a strategic level and in relation to everyday practice. Strengthen sustained capacity within schools to secure improvement across different aspects of work and from varying starting points. Equip schools with a strong evidence base to demonstrate the positive impact of leadership and strategies for change on improved outcomes. Strengthen the culture of reflection and evaluation within the school, coupled with the significance of strategic planning routed in a robust evidence base and clarity of desired impact. Foster closer school to school partnerships and the benefits of a self-improving system beyond the single institution. To see the current Subject Network events, vist the new Subject Networks page. 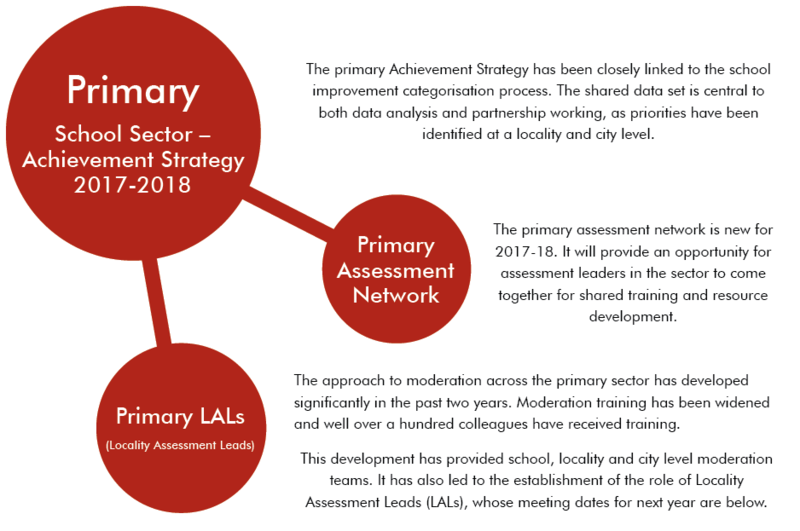 The Primary Leaders’ Partnership (PLP) has been at the centre of the growth and success of partnership working in the primary sector in Sheffield. Without the success of PLP, it is very unlikely that there would now be a Learn Sheffield. Ironically, in some ways, the arrival of Learn Sheffield has made the role and purpose of PLP less clear, with the re-introduction of leaders’ briefings and workshops about priority issues coming from Learn Sheffield. The feedback from school leaders across all sectors is that the opportunity to come together for decision making, sharing information and development training is valued and should continue to be available. The plan for 2017/18 is below, with each sector holding partnership meetings to provide a decision making body for the sector. In addition to these meetings, a half termly leaders’ briefing will be available to colleagues from all three sectors. These briefings will involve high quality speakers and, therefore, dates and venues will be scoped to ensure that this is possible. The Primary Leaders Partnership (PLP) will meet six times in 2017/2018. The PLP meetings will take place at 11.00am, following the Leaders’ Briefing in each half term. The Special Leaders Partnership will meet six times in 2017/2018. The Secondary Leaders Partnership will meet six times in 2017/2018. This is in addition to separate school improvement development meetings. Dates of the meetings, which will be held in schools, will be shared early in the autumn term. Details of the Leaders’ Briefings for 2017/18 will be shared as soon as they are available. The briefings will involve a range of high quality local, regional and national speakers to extend and develop our thinking on a range of subjects. 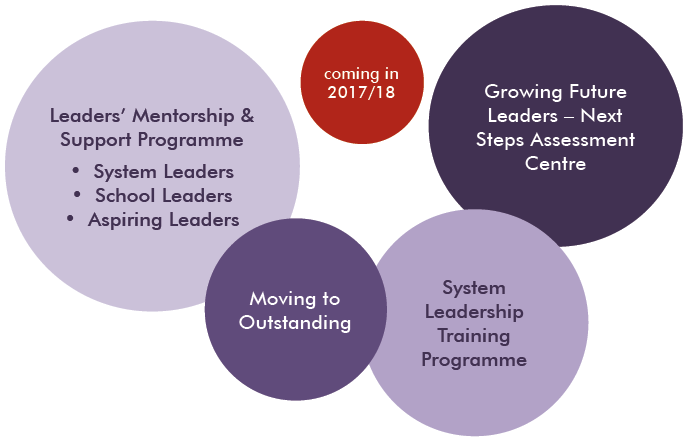 Learn Sheffield began working with ECM Education a year ago in order to source leadership training which was offered to Sheffield schools as part of their entitlement to support following categorisation. This year we continue to work in partnership with ECM and have negotiated a discount for all Sheffield schools on this fuller programme of senior and middle leadership training. For schools purchasing places this training will cost £180 per session. We will continue to use appropriate sessions to support and challenge targeted schools but the programme is now open to all. Several conferences have been mentioned throughout this section of teh website. They are all collaborations between partners within the city and beyond, and Learn Sheffield is proud to be involved in them. The list below gathers together this information into a timeline of the year. More information about the conferences and links to booking information, will be available on the Learn Sheffield website during the summer. This conference will explore the role of schools in tackling inequality and poverty. Key note speaker Jim Davis, MBE, will share a perspective on school life and the effects of poverty from across the country. Leaving Poverty at the School Gates will also feature the ‘Sheffield Fair Money’ directory, a financial toolkit, and other local speakers with local understanding and an insight into effective practice. This conference builds on the highly successful Primary and Early Years Conference that has been hosted by SHU for a number of years. The Teaching & Learning Education Conference will be a full day of activities to support teachers, educators and researchers in primary and early years settings. Key note speaker Dame Alison Peacock will launch the day and details will follow in September 2017. We would like to develop the South Yorkshire Education Festival, a Leadership Conference with a difference – one which utilises the brains, venues and resources of the region. In 2017 the Sheffield TSA Group, which includes Learn Sheffield and Sheffield Hallam University, will work with colleagues from other South Yorkshire TSAs to make a first step. Details to follow in autumn term. This project is focussed on using collaborative research to improve pupil outcomes in mathematics. It was piloted in 2016/17, with schools in the primary, secondary and special sectors and has been jointly funded by Learn Sheffield and the Maths Hub. Lesson Study is similar to the work done in professional learning communities, often called Teacher Research Groups (TRGs) however the process is very different in a number of key aspects. The process is a whole school initiative (or departmental in Secondary). Over the year all staff are involved in at least one of 3 lesson study cycles in the process either as part of the planning team or the observation and evaluation of the research lessons. The use of an external expert and relevant research is an important part of the process in the exploration of the whole school research question. The development of the research lesson focuses on precision teaching by planning carefully for anticipated responses, using specific problems given to the whole class. The teacher’s ability to use the anticipated responses to develop a deep understanding of the mathematics is an important part of the professional learning. The project is collaborative across schools with a commitment from members of staff to attend research lessons in other schools. Schools that have been part of this project in the first year have developed the skills required to teach at this level using these precision techniques. The project, which is outlined on the right, is led by Bob Sawyer (bobsawyer16@gmail.com), who can be contacted for further information. The lesson study conference has been developed in partnership between the South Yorkshire Maths Hub and the Sheffield Institute of Education. Attend training and development events (2 half days). Engage in the research and documentation associated with each research lesson. Take part in each Lesson Study cycle each term either as a member of planning team or observer of research lessons in own school. Attend one other research lesson per term in another project school. In addition it is hoped that lead teachers or research leads within the project schools would aspire to develop their role as a knowledge other to support the Lesson Study and to take part in a city wide conference in the autumn term 2018.
research project for six schools. A briefing for schools who would like to find out more about the project will be held on 12 September 2017 at 9.00am Learn Sheffield. Given the level of commitment required to participate successfully in this project, this briefing is essential for schools who wish to take part and be considered for a place. Contact Evelyn Priestley to book a place at this briefing (evelyn.priestley@learnsheffield.co.uk) or contact Bob Sawyer (bobsawyer16@gmail.com) directly if you are unable to attend but would like to discuss the project further. For more information about the work of the South Yorkshire Maths Hub visit https://www.symathshub.org.uk/. There has been a significant focus on reading within the city in recent years, including a number of locality projects and initiatives. Learn Sheffield is working closely with ESCAL to ensure that the learning from these different approaches is shared widely across the city. ESCAL, as you will already know, is Sheffield’s national award winning City Wide Literacy Strategy, which was founded to drive a collective responsibility for realising the aspiration ‘Every Sheffield Child Articulate and Literate’. The strategy continues to make links between existing good practice, identify gaps and explore opportunities to expand support for literacy. ESCAL has achieved national recognition and a high profile for Sheffield winning the prestigious Pearson National Communication Strategy award 3 years running and joining the judging panel for the 2016 and 2017 awards. ESCAL has been involved in shaping the ‘Read on Get on’ campaign and ‘Vision for Literacy 2025 - a strategy to get England’s children reading’. ESCAL is an external consultant for the National Literacy Trust, and a number of other Local Authorities and organisations around the country. ESCAL is able to offer training to individual schools/academies or groups, including localities and MATs. Details of CPD courses are included on the ESCAL website. For 2017/18 ESCAL is having a city wide focus on reading and will be offering events and seminars focusing on a number of different interventions. Some tasters are listed below. 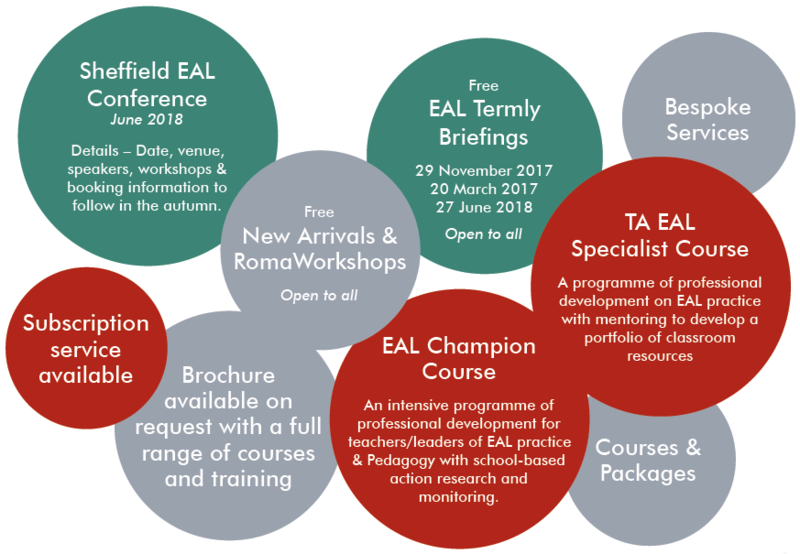 In 2017/18 the ESCAL Champions network will focus on providing access to case studies from a wide range of schools and academies with a range of different approaches to the teaching of reading at each key stage. The EAL New Arrivals team works in partnership with Sheffield City schools to narrow the attainment gaps and improve the life chances for pupils who have English as an additional language, who have recently arrived in this country. They provide a range of services to schools, teachers and pupils, including bespoke training and support locally and nationally. For more information about any of the content below, contact EALNewArrivals@sheffield.gov.uk. This Sheffield Safeguarding Hub is a city-wide multi-agency team, which was created alongside the wider redesign of early help services. The Hub is designed to provide a simple point of access to screen new safeguarding concerns from professionals and members of the public. You can contact the Hub on 0114 273 4855 (24 Hours). will be a briefing on the development of the Sheffield Safeguarding Hub and the threshold of needs at the first Leaders Briefing of 2017/18 - this will be at Learn Sheffield on the morning of 28 September 2017. The Hub will screen concerns where the child is suffering or likely to suffer from harm. If the child is not currently at risk but support is needed you should continue to refer for Early Help through the MAST team by completing an Early Help part 1 form. MAST have a new single number if you need further advice (0114 203 7485). Wherever possible you should inform the family that you are contacting social care and why and seek their consent for social care to share information with other professionals if necessary. This will support swifter decision making. However you do not need consent if this will put the child at risk. 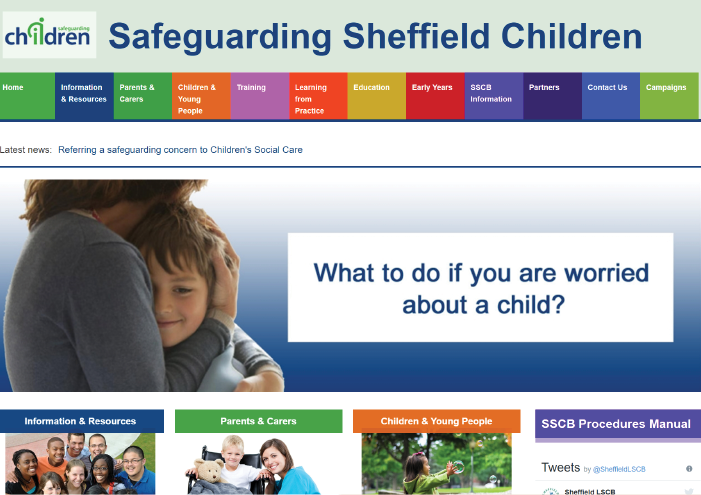 The Safeguarding Sheffield Children website has a wealth of information and resources - www.safeguardingsheffieldchildren.org/sscb. This includes the policies and procedures toolkit, information about training and information for children, young people, parents and carers. For information or to book any of the below, please contact NSPCC Campaigns Manager, Helen Westerman, hwesterman@nspcc.org.uk or call 07870 164937. Briefing sessions for staff, using the NSPCC’s PANTS resources, to help them talk to KS1 and KS2 children about sexual abuse. Workshops for parents and/or staff about how to keep children safe online, developed by the NSPCC in partnership with O2 (plus free booklets to disseminate). Monthly lunchtime seminars at the NSPCC Service Centre in Sheffield exploring various aspects of child sexual abuse and exploitation for those working with children and families. PANTS booklets for parents delivered to school. Share Aware booklets for parents delivered to school. Campaign posters delivered to school. All seminars will take place at the NSPCC Service Centre in Sheffield between 11.30-1.30pm (except 28 September 2017 which is 12.00-2.00pm) and are FREE OF CHARGE to attend. They will be facilitated by a range of agencies. To book a place on any of the above, please email Nadia Azim nadia.azim@NSPCC.org.uk. 1 in 12 children and young people provide mid to high-level care (BBC 2010) but many remain hidden until a crisis. This equates to over 7000 young carers in Sheffield, up to three in every classroom. Caring can have profound impacts on young people’s own health, well-being, education and social development. Early identification is vital to minimise these impacts and ensure young carers remain safe, well and can achieve their best. Learn Sheffield has been working with Sheffield Young Carers to address our priority to ‘identify all young carers and provide them, and their families, with appropriate support’ by 2020. This has included a targeted project in five schools aiming to embed SYC’s bespoke young carer identification process, in addition to providing briefings and training for headteachers, governors and for the Primary Inclusion Panel. The Sheffield Parent Carer Forum is an independent local charity which brings together over 1,400 families who have a child or young person with a disability or special educational need. They exist to provide mutual support, share information and influence policy and practice. Providing an information and signposting service. Organising information events and training sessions for parents. Organising social events where families can meet each other. Gathering parents’ views and representing them at strategic meetings. We can come to your school and run a coffee morning or afternoon for parents of pupils with SEND. Our meetings are friendly and informal, with lots of opportunities for signposting and peer support. We have produced a range of clear, parent-friendly booklets about SEN Support, EHC plans, transition to adulthood, and more. All our publications have been fact-checked by council officers. Contact us to request hardcopies or download PDFs from: www.sheffieldparentcarerforum.org.uk/resources. An information day for parents and professionals. Learn about services and resources that can support the mental health and emotional wellbeing of children and young people with SEND and their parents and siblings. 17 November 2017, 9.30-2.30pm. For more information and to book your place, go to: www.sheffieldparentcarerforum.org.uk/events. SENCOs, teachers, learning mentors, TAs – please sign up as associate members to receive our monthly email bulletins and bi-annual newsletters! Registration only takes a couple of minutes and is completely free. Just go to www.sheffieldparentcarerforum.org.uk and click on “Become a member”. The Cohesion, Migration, and Integration Strategic Group contains representatives from Sheffield City Council, third sector, South Yorkshire Police, university and faiths groups. They have developed the Cohesion Strategic Framework for Action which has a long term vision that everyone in Sheffield is made welcome and treated with dignity and respect. Learn Sheffield is on the Enabling and Learning Group for Cohesion Sheffield, to promote cohesion in Sheffield schools in line with the ‘readiness’ priority that every Sheffield young person should make a positive contribution to their community. One way that schools can contribute is by taking part in the forthcoming ‘I’m a Sheffielder because...’ competition involving visual arts, poetry and short stories, described below. The exhibition of this work will be held in the Sheffield Winter Gardens (16-22 October 2017) to coincide with the launch of the Sheffield Together Cohesion Hub, which has been developed with funding from the Paul Hamlyn Foundation. share as citizens of Sheffield. For more information about the ‘I’m a Sheffielder because…’ competition, including how to get involved – visit the Learn Sheffield Commissions page and download the ‘I’m a Sheffielder because…’ expression of interest form. Further details of the Sheffield Together Cohesion Hub launch will be shared with schools in September. The ‘I’m a Sheffielder because…’ exhibition will remain in the Winter Gardens for the week that follows the launch. Move More is Sheffield’s physical activity strategy. It aims to transform Sheffield into the most active city in the UK by 2020. 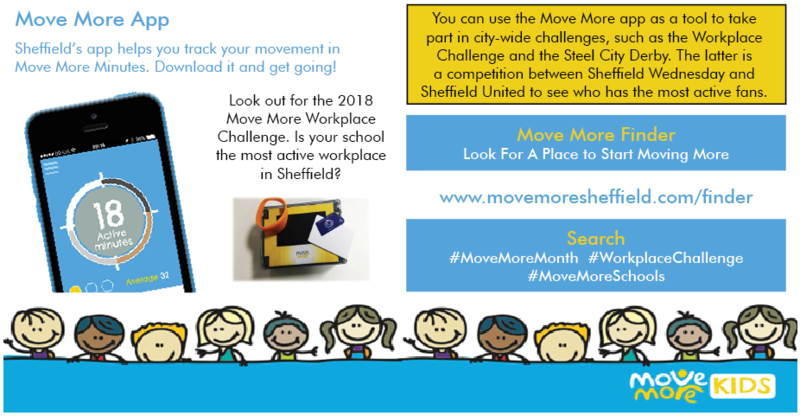 Move More is led by the National Centre of Sport and Exercise Medicine Sheffield, which includes partners from every aspect of Sheffield life. Active schools forms a core part of the Move More programme with the ambition for Sheffield to have the fittest kids in the UK. Evidence suggests this would improve behaviour, concentration and focus within class, as well as physical and mental health. This can be achieved by embedding physical activity within the school day, changing the school environment to make it easier for teachers and pupils to be active and most importantly having fun. There’s the Move More Schoolyard Challenge which uses wristband sensor technology to create fun challenges for kids and teachers that gets them moving. More information at: www.movemoresheffield.com/schoolyard-challenges.